This popular herb can be a little confusing. It has several common names, such as Milk Thistle, Marian Thistle and St Mary’s Thistle; and it also has more than one scientific name, for example, Carduus marianum and Silybum marianum. To make matters worse sometimes supplements are labeled as Silymarin, which can either be a whole extract of the plant part (usually standardized to 70 to 80% Silymarin) or it could be just the Silymarin from Milk Thistle. Traditionally, the seed is most prized for medicinal purposes but the whole plant was also used. Silymarin is a collection of flavanolignans found in Milk Thistle, most notably: Silybin, Silychristin, Silbinin, and Silydianin. These are thought to be the primary phytochemicals that give Milk Thistle its many health benefits. Traditionally it has been used to protect the liver, in conditions such as hepatitis, alcoholic liver disease, fatty liver, pre-menstrual tension, mushroom poisoning, and detoxification. These traditional uses are now being supported in modern studies, mostly in animals, but human studies are coming out too. What is Milk Thistle good for? Protecting the liver – by increasing antioxidant production such as glutathione, not only in the liver but also in the lung, stomach, skin and small bowel. In a rat model, it also protects against alcoholic induced liver injury. Cancer prevention and treatment – there are many studies demonstrating the benefits of Milk Thistle or Silymarin in the prevention or treatment of cancer, including: prostate cancer , tongue cancer , bladder cancer , colorectal cancer , and breast cancer . Although I have found one negative study that showed a promotion of breast cancer cells. Protection from UV radiation – topical application of silymarin has demonstrated significant protective qualities for the skin as well as preventing cancer progression . Silibinin, topically, also showed these benefits . Protects the kidneys – it can prevent chemical damage to the kidneys caused by the drugs paracetamol, cisplatin and vincristin . Hormone metabolism – a study involving 40 healthy pre-menopausal women showed that while there was no substantial effect on estrogen there was a decrease in early-follicular phase androgens, demonstrating that there may be some merit to the traditional use of Milk Thistle for hormone metabolism and balance. Many of these studies also mention that Milk Thistle has a great track record for safety even in large doses, although if you have an allergy to the daisy (compositae) family you may want to be careful because Milk Thistle is part of that family. Side effects can occur, but they are similar in frequency and nature to the side effects of placebo. As you can probably tell, Milk Thistle is a marvelous herb for the herbal dispensary, and your health. 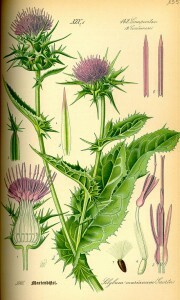 Milk Thistle was also used as a food. In the spring its prickles were cut off and the plant was boiled with other herbs, and the flower was treated and cooked like artichoke. There is a story that the white veins in the leaves of this plant were caused by the Blessed Virgin when she fell on a thistle plant. This is why it is sometimes called Our Lady’s Thistle and is the reason for the Latin name for the plant. Healers of the past, such as Gerard, Dioscorides, and Culpepper, used this plant for diseases of the liver, and for snake bite. It was considered a good “blood cleanser”. You can probably see why I say that it is Marvelous Milk Thistle. It is such a useful and beneficial plant.